1934 - The French House was the brainchild of Dr. James P. Broussard, then-Chair of the LSU Department of Romance Languages, and was originally conceived as a French language and cultural immersion dorm that would "help keep French culture in Louisiana alive." Dr. Broussard received a legislative appropriation of $75,000, or about $1.3 million in today's money, for construction of the building. Final cost of construction ran over $120,000, or about $2.1 million today. Plans for the French House were drawn up by Weiss, Dreyfous & Seiferth, a New Orleans architectural firm that also designed the Louisiana State Capitol. French House plans were developed in imitation of a specific chateau Broussard had seen in Calvados in Normandy, France. 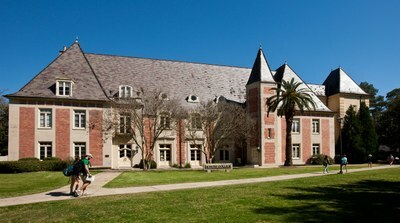 The French House was one of a number of buildings added to campus during the 1930s, under the administration of LSU President James Monroe Smith, widely considered to have been a "puppet" of then-Governor Huey P. Long. During Smith's tenure, more than $13.5 million (about $220 million today) was spent on this new construction, which included the Huey P. Long Fieldhouse and the Tiger Stadium "dormitory" expansion. 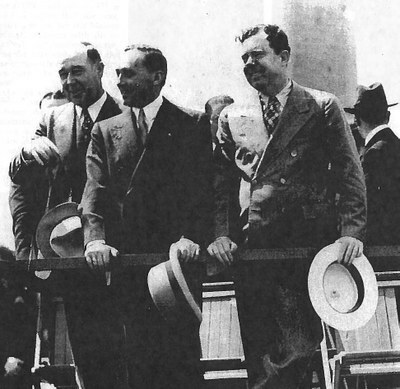 April 5, 1935 - The French House cornerstone was laid by Senator Huey P. Long and the French Ambassador to the US Andrew de Laboulaye, as part of LSU's Diamond Jubilee (75th anniversary) celebration. Enclosed in the cornerstone is a piece of red cypress wood taken from one of the earliest French settlements in Louisiana, Fort de La Boulaye, which was founded in 1700 at the mouth of the Mississippi River, near what is now Phoenix, LA. Remains of the fort had recently been discovered at that time, during the dredging of the Gravolet Canal. Also enclosed in the French House cornerstone is an affadavit of the wood's authenticity, a program of the Diamond Jubilee celebration, and a copy of that day's Daily Reveille. September 1935 - The French House officially opened as a Romance languages immersion dormitory. The building houses around fifty students in 22 bedrooms, primarily LSU foreign language majors, as well as two or three European foreign exchange students attending LSU for a semester or an academic year. The house was run by a "chatelaine" (literally, "a woman in charge of a large house"), Mrs. Anita Oliver Morrison. Morrison moved into the French House ten days after the assassination of Huey Long, and served as chatelaine for the next 23 years. A small bust of Napoleon that was one of Louisiana's gifts from the 1949 "Merci Train;"
Two Louis Anglade copies of Vigee-LeBrun paintings that hang in the Louvre. A dining room and kitchen were located just off the Grand Salon in the north wing of the building. Etageres in the dining room displayed Morrison's large collection of Quimper faience, glazed ceramics produced in Brittany that are typically decorated in bright colors and traditional Breton peasant figures. During dinner, students sat at one of four French tables, one Spanish table, or one Italian table, and spoke only in that table's language. The south wing of the building contained a small apartment for the chatelaine and a library housing books given to LSU by the French government. One wall of the library displayed a mural of Paris, also donated to LSU by the French government and originally painted by by Joseph de La Nézière for the French Pavilion at the 1939 World's Fair. 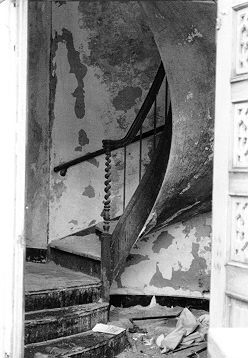 The second and third floors of the French House were all dormitory rooms, with men housed in the north wing and women in the south, and separate stairway entrances for each. In the original building layout, no interconnection existed between the men's and women's wings above the first floor; the only adjoining space in the building was the Grand Salon. On the third floor, bedrooms contained the building's distinctive "oiel de bouef" round windows. February 18, 1936 - Grand opening reception of the French House. In her memoirs, Morrison recalls that "all the resident girls wore Louis XVI costumes and helped with the serving." Spring 1936 - Reception at the French House honoring acting Governor James A. Noe. 1936-1937 - George Bonnet, French Ambassador to the US, received at a luncheon at the French House. 1927-1938 - Two notable guests: Émile Lauvrière, a French historian of Acadia, resides in French House for two months; Dr. Jean-Rene Cruchet, who discovered a form of encephalitis, and his wife also reside in the French House for two months. Anita Morrison, left; James Broussard, right. 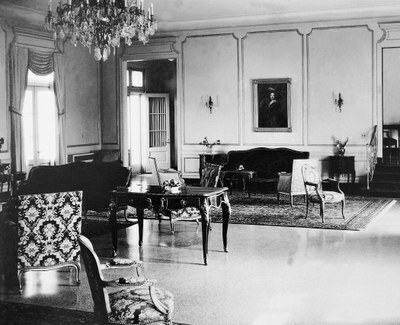 April 1939 - Count Jacques de Clouet of Bordeaux, a friend of Dr. Broussard's, donates to the French House a dore & Baccarat crystal chandelier from his hall of the family's ancestral chateau in Bordeaux. The gift was given in memory of the Clouet ancestors who migrated to Louisiana in the colonial era and settled near Bayou Teche. It arrives from France "so expertly packed, not a prism was broken." ("The Story of a Chandelier," Daily Reveille, September 17, 1943) The chandelier was hung in the library; this is not the same chandelier that today hangs in the Grand Salon. Fall 1940 - Latin American exchange students live in the French House for the first time. 1941 - "Pan American House," the white stucco building just south of the French House on Highland Road (known today as Acadian Hall) opens to residents. Building was originally intended to house 19 Latin American students and 19 American students, and French House residents often walked over to its large comedor for meals. December 1942 - With US involvement in World War II, "the French House closed its portals to students majoring in Romance languages... due to a shortage of French majors, as well as men" ("French, Pan American Houses Become Traditions," Daily Reveille, February 12, 1954). Army Specialized Training Program (ASTP) opens on LSU's campus. January-June 1943 - French House is temporarily converted into living quarters and club for Army officers attending ASTP and their wives. February 1943 - Grand Duchesse Charlotte of Luxembourg attends luncheon at French House. November 2, 1943 - Dr. Broussard passes away. Fall 1943-Spring 1946 - During the war years, the French House was home to wives of men in the service, as well as a few foreign language students, and for the first time, female graduate students. 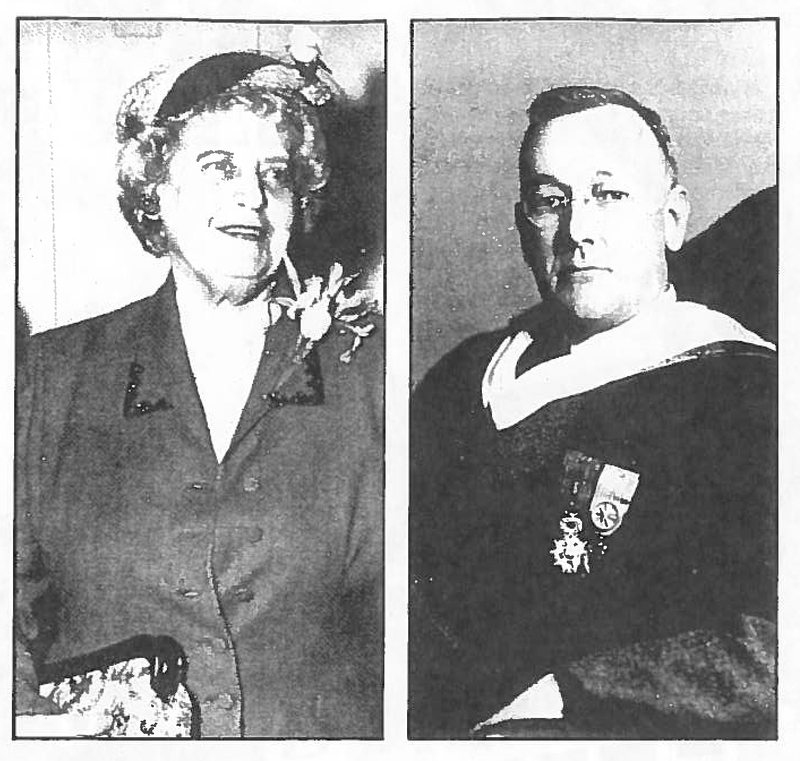 "There were frequent letters to the students bearing tragic news and also good news of borthers, husbands, and sweethearts in the war," Morrison states in her memoirs. "Those living in the House were as one big family, sharing each other's joys and sorrows and helping each other." September 1946 - Administration of the French House is returned to the Romance Languages Department, and the building once again begins exclusively housing foreign language and exchange students, but this time, only women. During the next ten years, the French House gradually becomes LSU's de facto international house. 1947 - The French government, acting through its embassy in New York, begins providing four French House room & board scholarships to outstanding LSU French majors. 1950 - La Semaine Francaise program is founded. This program brings French teachers from Louisiana, Mississippi, and Texas to live at the French House for a week of workshops, lectures, and "living in French." The La Semaine Francaise program ultimately resulted in the formation of the Louisiana Foreign Language Teachers Association. April 6, 1953 - Fire breaks out in the library. "This was the first real tragedy of the French House, and it was not very serious," Morrison notes. "The fire was quickly extinguished but caused considerable damage. Everything happens for the best. I had wanted the library done over for a long time, but had never succeeded... new furniture was purchased with the insurance settlement." November 10, 1953 - Ten female leaders of unions in France, including Marcelle Fanchon, costume designer for the French National Opera, tour the US to "learn something of the American everyday way of living and to study the employment of women" (Memoirs of Mrs. Anita Olivier Morrison). As part of this tour, the women are received at a luncheon at the French House. November 18, 1954 - On a tour of large US cities, the mayors of Paris, Bordeaux, Lyon, Marseilles, and Strasbourg attend a reception at the French House. 1954 - First year (excluding some of the war years) that there are no French foreign exchange students living in the French House. 1955 - Twentieth anniversary of Anita Morrison's "reign" as chatelaine of the French House. "I was especially happy to have been able to carry on Dr. Broussard's dream successfully so far," she says in her memoirs. Last year of La Semaine Francaise program. Fall 1956-Spring 1958 - French House houses female students of all levels (from freshman undergraduates to doctoral candidates), foreign language students, and foreign students. March 1958 - LSU President Troy Middleton tells the Board of Supervisors of the French House, "its role as a language center is not working out" and that "the building, one of the campus' handsomest, has developed into a 'catchall' building and is too expensive for that." President Middleton then announced plans to convert the French House into a dormitory for female graduate students. 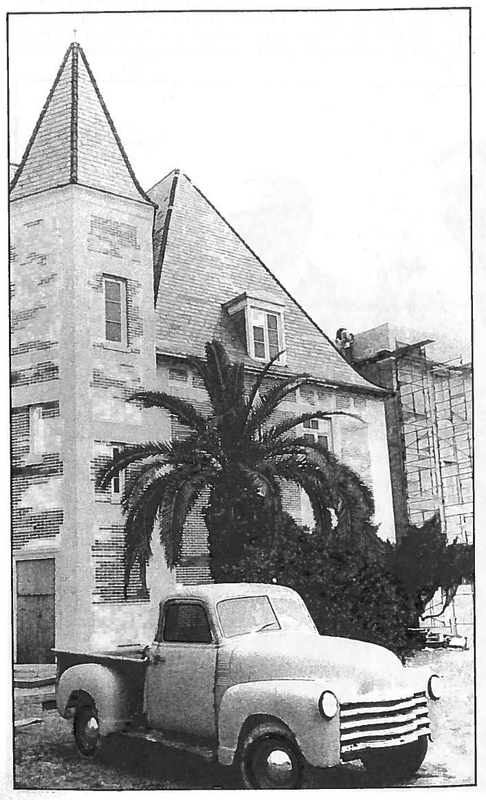 The Board of Supervisors "expressed regret that the French House had not lived up to its intended role of materially enhancing the state's coveted French culture" ("Chateau at LSU Not Working Out," New Orleans Times-Picayune, March 30, 1957). "That was the beginning of the end of the French House and also the end of Dr. Broussard's dream," Morrison notes in her memoirs. In a 1973 interview transcript (also included in her memoirs) Mrs. Morrison explains, "Today, things are so expensive, it's hard to maintain a 50 student dorm. Now they have 500 students in a dormitory. They closed those small dining rooms [on campus] so that they could promote the large cafeterias. The overhead for these small places was too high." Fall 1958 - Spring 1963- French House becomes the residence hall for female master's and PhD students, and houses "almost all the female graduate students on campus." The kitchen was permanently closed in 1958, and the dining room became a study space. According to Gertrude Beauford, a graduate student who resided in the French House during this time, "we often read in the beautiful library. All the books were in French and had lovely gold bindings. However, to my amazement, slowly through the months, the library books were appropriated by strangers. Although we tried to watch them, the library diminished" (Memoirs of Mrs. Anita Olivier Morrison). Fall 1964 - Fall 1968 - French House used as a dorm for undergraduate upperclassmen. 1967 - LSU's Honors Division is formed by the College of Arts & Sciences and the College of Chemistry & Physics. Fall 1968 - French House used as a temporary freshmen dorm for women until Miller Hall opened in October, after which the French House is permanently closed and locked. 1968-1979 - French House sits unoccupied and neglected, "allowed to slip into a state of vandalized dormancy... few if any of its original furnishings survived the period intact... building used for storage of surplus furniture and office equipment, and suffered greatly from leaks and vandalism" (French House architectural summary, William Brockway FAIA, 2007). During this decade, most of the original furniture, decor, and hardware is stolen from the building, including all mirrors and its "specially made bronze doorknobs, each bearing LSU" ("Vandals Visit," Baton Rouge Morning Advocate, May 25, 1975). The marble mantlepiece and chandelier from Bordeaux are both smashed and damaged beyond repair. Beauford said of her return visits to the French House during this time, "In , I was appalled to see her overrun with disorderly freshmen. But worst, in 1972, when I returned to see the French House was completely closed, the windows bare, the furniture dispersed. The abandonment of such a distinguished building was terrible to behold" (Memoirs of Mrs. Anita Olivier Morrison). Fall 1974 - Effort to restore the French House is spearheaded by student government, various faculty, and LSU Chancellor Cecil G. Taylor. Taylor had previously been a Professor of French at LSU. He had often taken his meals at the French House and had there met his wife, Ellen Albright, when she was a resident of the house. May 16, 1975 - At LSU commencement, Governor Edwin Edwards announces that he is recommending that funds be added to the state budget for the restoration of the French House. 1978 - LSU receives $1.4 million appropriation from the state to renovate the French House. An addition is added to the south end of the building that includes a second fire-code compliant staircase (for a total of three, two of which are code "legal"), an elevator, and a heating and air conditioning unit. Radiators were removed from the rooms, broken windows were repaired, and floors were buttressed to meet load requirements for office buildings. First floor was converted into miscellaneous offices, and the cafe was reopened as a campus coffee and beignet shop. Second floor was converted into offices for LSU Press, and the third floor was converted into offices for Phi Kappa Phi, the nation’s oldest honor society for all academic disciplines, which had decided to move its national headquarters to LSU in 1978 because of the promise of this new office space. The marble mantle in the Grand Salon was replaced, and "an 80 year old black plasterer from New Roads, a remarkable artisan, had the skills necessary to repair the ceiling cornices and build a replacement ceiling medallion in the Grand Salon. He also finished the plaster coins on the exterior of the new south tower" (French House architectural summary, William Brockway FAIA, 2007). January 5, 1981 - Anita Morrison passes away. April 3, 1981 - French House is rededicated in ceremony featuring Francois de Laboulaye, French Ambassador to the US and son of Andrew de Laboulaye, who had helped to lay the building's cornerstone. A representative from the Council for the Development of French in Louisiana (CODOFIL) also gives remarks. 1982 - French House is listed on the National Register of Historic Places. 1992 - LSU Board of Supervisors gives Honors Division major-college status and a Dean. Fall 1999 - LSU Honors College moves in to French House in order to unite the residential and academic facilities of the college; Laville Honors House, the residence hall for Honors students, is right next door to the French House. November 11, 1999 - French House rededicated as the home of the Honors College in a ceremony coinciding with Armistice Day. Honors College Dean Bill Seay, LSU Chancellor Mark Emmert, and LSU System President William Jenkins give remarks. "At first, it was a Louisiana honors college, then it was a regional honors college, and now it is nationally recognized for the quality of its programs," Jenkins said. "I look forward to the decades of success that lie before you" ("Fanfare marks rededication of French House," LSU press release, November 17, 1999). The Honors College shares its space in the French House with Phi Kappa Phi, University Dining Administration, and the Department of French Studies. 2004 - Honors College Dean Nancy Clark begins ten-year effort to obtain state financing for a second renovation and full modernization of the French House. December 2014 - LSU receives $5 million in capital outlay funding from state government for construction, and renovations begin on French House; Honors College staff temporarily relocate to Johnston Hall. French House renovations are scheduled to be completed in late 2015, with Ogden Honors College staff and classes returning to the building for the Spring 2016 semester. Would you like to leave a legacy that will support Ogden Honors students in perpetuity? With nearly 50 naming opportunities on the Honors Campus, including the development of a landscaped "Honors Grove" between the French House and Laville Honors House, we welcome your partnership through investment in student achievement and success with a named space honoring or remembering a friend, former professor, family member or loved one. For more information on how you can contribute to the future vitality of the Honors Campus, contact Director of Development Danielle Mack, CFRE, at dmack@lsu.edu or 225-578-6868. Dixon, Margaret. "La Maison Francaise." LSU Alumni News Dec. 1935. "La Maison Francaise Adds Old World Touch to LSU; Marks Tribute to French." The Daily Reveille 28 Aug. 1940. "French House Mural Exhibited in Art Gallery." The Daily Reveille 22 March 1941. "La Maison Francaise Symbolizes French Heritage of Louisiana." The Daily Reveille 17 Sept. 1943. Rod, Jane. "La Maison Francaise Holds Beauty, Culture of France." The Daily Reveille 29 Aug. 1944.
de Lesseps, Ed. "Rennaissance of La Maison Francaise." New Orleans Times-Picayune 19 Jan. 1947. "Pottery Adds to Briton Dining Room in L.S.U. 's French House." Baton Rouge State-Times. "LSU Is Given French Books." Baton Rouge State-Times. 10 May 1947. Wells, Patsy. "Maison Francaise Offers Old World Charm." The Daily Reveille 11 March 1949. Thanton, Leonora. "French House Patterned After Chateau in France." The Daily Reveille 10 Jan. 1952. Harroun, Jim. "French, Pan American Houses Become Traditions." The Daily Reveille 12 Feb. 1954. Todd, Ruth McInnis. "The Story of a Chandelier." Baton Rouge Morning Advocate 2 Jan. 1955. Cohn, Margie DeBretton. "La Maison Francaise." The Register 1 Dec. 1956. Doane, Charlotte. "French House Brings Together Girls of Many Different Cultures." The Daily Reveille 1 Feb. 1957. "Chateau at LSU Not Working Out." New Orleans Times Picayune 31 March 1958. Flynn, Sharon. "French House Has Long Tradition." The Daily Reveille 25 March 1959. "Former Point Coupeeans Revive Interest in French House." Baton Rouge State-Times (?) 6 Sept. 1973. "Vandals Visit." Baton Rouge Morning Advocate. 25 May 1975. Champagne, Mary. "French House Days are Recalled." Baton Rouge Morning Advocate 25 May 1975. Elwell, Jeff. "La Maison Francaise." LSU Alumni News June/July 1981. Louisiana State University Department of Architecture. "French House Study." Oct. 1974. Brockway, William. "The French House." 1 Nov. 2007. Morrison, Anita Olivier; Marietta Millet, and Gertrude M. Beauford. "A History of the French House: Memoirs of Mrs. Anita Olivier Morrison, Head Resident 1935-1938" plus collected interviews. Gertrude M. Beauford Papers.